Wipe clean or toss the seat cushion into the washing machine. Weight 5.26kg. Size H60.96, W86.36, D71.12cm. Bright Starts Finding Nemo baby Walker. Condition is Used, but in good condition, like new. Bright Starts toddler walker hardly used. 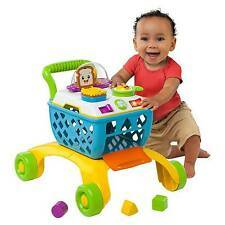 Bright Starts toddler walker hardly used, simple and easy for babies. Walker Activity for Toddlers. Condition is Used. Collection in person only. 4.5 out of 5 stars - Bright Starts toddler walker hardly used. 15 product ratings15 product ratings - Bright Starts toddler walker hardly used. Walker Musical Zoo. Condition is Used. Collection in person, cash on collection preffered. used in good condition. 3 adjustable height positions to grow with baby. Bright Starts 3-in-1 Activity Centre Around We Go. 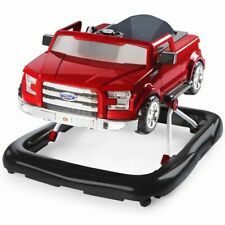 one of the best purchases I made, helped my baby learn to walk and had fun at the same time! Condition is used but in great condition always cleaned with Milton steriliser. the Walker section can be removed and used as an activity table on its own Collection in person ONLY From DE5 Derbyshire / Codnor Ripley. Any questions please ask - from smoke free homes. 5 out of 5 stars - Bright Starts Pattern Walker. 1 product rating1 product ratings - Bright Starts Pattern Walker. Your little monkey will love bouncing and exploring in their Bright Starts Pattern Pals Walker ! Pattern Pals. The jumper has 3 adjustable height positions to grow along with your little one, making sure their toes are at the perfect height for bouncing. The Pretty in Pink Pondside Princess Walk-A-bout walker is playfully pink and perfect for your baby. A high backed seat provides comfort and support for your baby and 3 height positions allow it to grow with them. Baby walker features Baby can use as a walker, and then graduate to walk behind and push. Your little one will find plenty of engaging activities in the removable toy station that's great for floor play and on-the-go. The Disney Baby Winnie the Pooh Happy As Can Bee Walker from Bright Starts will surround your baby with the most beloved friends from the Hundred Acre Wood. This sturdy platform with added safety features entertains babies on the move with a removable toy station that's great for on-the-go, a spinning roller ball with beads, fun Winnie the Pooh squeaker, and Tigger toy. Bright Starts 4 In 1 Walker Shopping Trolley. Excellent condition. This is fun for baby. The popcorn pops and it plays some musical sounds too. Collection from New Barnet. Great condition, used from around 7 months of age up to approximately 10 months. Please see images. Current RRP in Argos, Amazon & Boots £49.99 Only ever used inside. Folds down for easier storage. The steering wheel toy does apparently come off although we’ve never removed it. From a smoke & pet free home. Please feel free to ask any questions before committing to buy, no returns. Would prefer collection due to size but will box up & send via courier if collection not possible. Please only buy or make an offer if genuinely interested! No time wasters please. Takes batteries and has a pretend popcorn maker that is great fun as well as toast (pop up) and eggs (spin round) on the top. Like new, fully working condition. Cost £49.99 new. Your wild one has places to go! As your baby zigs and zags around the house in this fun walker, you can cheer from the sidelines. Tippy-toes can take off at top speed while you cheer on your pre-walking tot. This baby walker only been use twice because my daughter didn't like. Bright Starts Baby Walker- Musical. 4.5 out of 5 stars - Bright Starts Baby Walker- Musical. 15 product ratings15 product ratings - Bright Starts Baby Walker- Musical. When baby is beginning to sit up, he or she can hang out in the comfy seat and play with the spinning and rattling toys. Keep baby happily entertained with spinning the bee rollerball filled with colorful rattle beads, sliding the beads of the bead chaser, or soothe sore gums with the leaf teether. Features: Safe & sturdy platform for pre-walking wild ones. Safety enhanced with rubber feet that "brake". Seat pad is easy to remove for machine-washing. Extra-high seat supports baby with 3 height positions. Good for hand and eye coordination. Has a few thinks on the handle. It's the cutest baby walker in the hundred acre wood! babies and moms get what all the “hoopla” is about with disney baby’s winnie the pooh happy hoopla walker from bright starts. it features a removable toy station, lights, sounds, a fun honeypot toy and fold flat for storage and portability! Baby Walker Bright Starts. Condition is Used. Dispatched with -. Bright Starts Lion, Ride On or Adjust to Push Along, Light & Sound, Original 3 balls included. This item is collection only. This lovely walker is perfect for a little one from 6-12 months to encourage sitting up, walking,play,etc. Comes with removable piano station with lights & sounds. Roller drum with bead chaser, Minnie Mouse figure and a twisting flower with beads. 3 easy adjustable height positions. Removable seat pad is easy to clean. High seat back provides additional support. Disassembles for easy storage. Link loops for attaching more toys. A few light marks/scuffs but overall very good condition. RRP £55-£80 so is a great buy. Collection Amesbury. Thanks for looking. Seat cushion is machine washable. Item model number: 60594. Batteries included?. Batteries Required?. 4.5 out of 5 stars - Bright Starts Pattern Pals Baby Walker. 3 product ratings3 product ratings - Bright Starts Pattern Pals Baby Walker. Adorable stroller styling encourages early role play and nurturing. When your little one is ready for walking, the Stroll-Along Musical Walker is ready to provide the steady support she needs. A press of the magic wand button rewards baby with fun sounds. A high seat back provides comfort and support for baby and 3 height positions keep little toes the perfect height. Images shown are only a representation and may vary. Adjust the handle height to accommodate yours. Bright Starts Baby Walker - Barely Used - Basically New. Condition is Used. Collection in person only. Push the light up button for sizzling sounds or spin the egg roller. Includes 3 shapes for shape sorting fun. Useful Links. TV & Film Character Toys. Weight: 3.18kg (approx). Bright Starts™ Walkin’ Wild Walker™ is a walk on the wild side! Baby will find plenty of engaging activities in the removable toy station that's great for floor play and on-the-go. When the toy station featuring a ratcheting monkey toy and spinning beads is removed, the built-in tray lets baby play with other toys. Seat cushion is machine washable. The cradling seat with soothing vibrations provides the perfect amount of comfort and support for baby. colourful, engaging characters and patterns make this seat fun! the toy bar removes easily with one hand.